Previous owners installed two wall sconces - one dimmer. That dimmer control plate broke/cracked (a glyder type) I have an Ariadni toggle that I would prefer. The glider had by looking 3 wires (single pole) 1 green, 1 white, 1 black. after turning off breaker, disconnecting I found that actually 2 of each - for the two sconces. I wrapped the two black together as well as the other two color to themselves then connect to the new switch. went to test and breaker/switch "popped" checked connections etc looked fine. turned breaker back on and lights were on. but dimmer wasn't controlling, light are staying on. Breaker off, reconnect no pop but light stay on, disconnect new switch but back old one, same thing - breaker/switch popped. checked wires again hit breaker and lights are staying on for old switch. 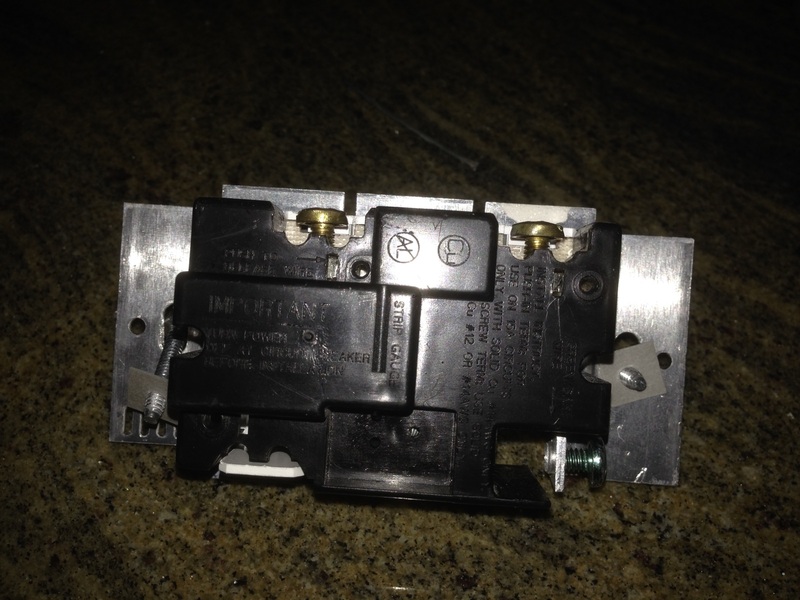 when the breaker popped did it kill the dimmer switch? the wiring is short as it is so cant keep stripping back. Options or solutions or advice. I have done switches all over the house this is the only issue so far. Every switch sits in-between two hot wires. One is always hot, from the mains, and one is hot when the switch is active, and that one goes to the controlled device(s). 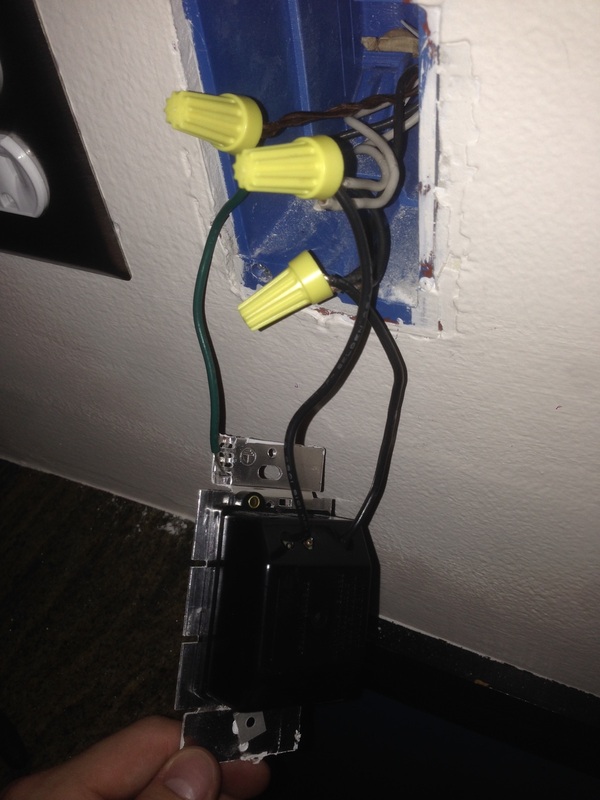 It sounds like you have connected the hot wire (black) from the mains directly to the hot going to the fixtures. The always hot switch should be connected to one black wire on the dimmer and the black from the fixture to the other black on the dimmer. Check the dimmer to see if there is a marking to indicate which is which. The easiest way to test which black wires are which is to use a non-contact tester. Turn off the breaker. Separate the black wires, put a wire nut on the exposed end of each and turn the power back on. Check each black wire to see if it registers as hot on the tester. The one that is hot is the mains. The one (or more) that are not go to the fixtures. In general, all white (neutral) wires are connected. This assumes the white wire is not being used as a hot line. If it is, it should be marked with a black marker or a piece of black tape. Similarly all greens and bare wires (ground) are connected. Some dimmers need a neutral wire and some do not. It sounds like yours does. It should be connected to the other neutrals. Similarly the grounds should all be connected. I'm going to assume; since power has to come from somewhere, that one cable is power from the panel, and the other is to the first light. Which means you should connect the two white wires together with a twist-on wire connector. Then connect the black wires to the switch terminals, one wire per terminal. When you connected it as in the first image, you created a manual short-circuit device. Every time you flipped the switch on, you created a short-circuit. Why does my fan switch sometimes turn the lights off? Why is there a one second delay before the lights turn on with this new dimmer switch?